This waterproof mattifying and re-texturizing complexion primer features optical matte-blur technology that reduces the look of imperfections. It leaves a shine-free matte canvas for your foundation to last 12 hours. The silky, invisible gel is ideal for oily or combination skin, while it helps to erase pores and resurface uneven skin texture from fine lines, dry patches, or acne scars. The nutrient-rich formula infuses antioxidant botanical extracts into the skin to help neutralize free radicals so that your complexion gets an immediate skin-boost, even before makeup. Formulated WITHOUT : Parabens, Phthalates. 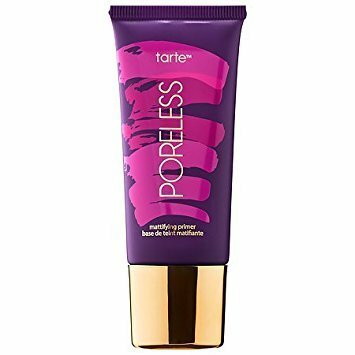 This product is dermatologist tested and formulated with tarte's 12-hour power. Suggested Usage : Prior to foundation, apply a thin layer onto clean, hydrated skin, focusing on the oily T-zone or other pore-prone areas. Try dabbing it under the eyes or on the eyelids for a smooth, even surface, or wear it on its own as a shine control treatment.